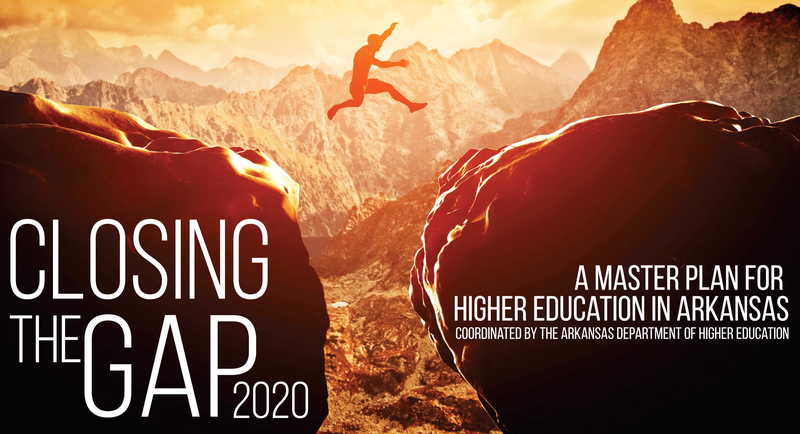 Closing the Gap 2020: A Master Plan for Arkansas Higher Education, will be presented to the Arkansas Higher Education Coordinating Board on October 30, 2015. The 2015-2020 five year planning cycle adopted in this plan is a critical component in the long-term objective to reach the 2025 goal of a 60% post-secondary attainment rate in Arkansas, increasing from the current estimate of 43.4%. By 2020, we will reduce the educational attainment gap in Arkansas by increasing the number of postsecondary credentials by 50% over the 2013-2014 academic year levels; increasing the number of certificates awarded to 19,200; associate’s degrees to 12,700; and bachelor’s degrees to 19,900. Progress Report: Since the approval of the Master Plan for Higher Education in 2015, Department of Higher Education and public institutions of higher learning in Arkansas have implemented a number of strategies to reach the goals set out in the plan. Contained in this report is the progress made toward the stated goals and a look to the future of Arkansas higher education. Below is a draft of proposed goals to be included in the Closing the Gap 2020 Master Plan. GOAL 1: Raise completion and graduation rates of colleges and universities by 10%. Reduce the percentage of students needing remediation to prepare them for college-level course work. Reduce the time needed for students to complete remedial requirements. Raise first year retention rates of students to SREB regional averages. GOAL 2: By fall 2018, increase the enrollment of adult students, age 25 to 54, by 75%. 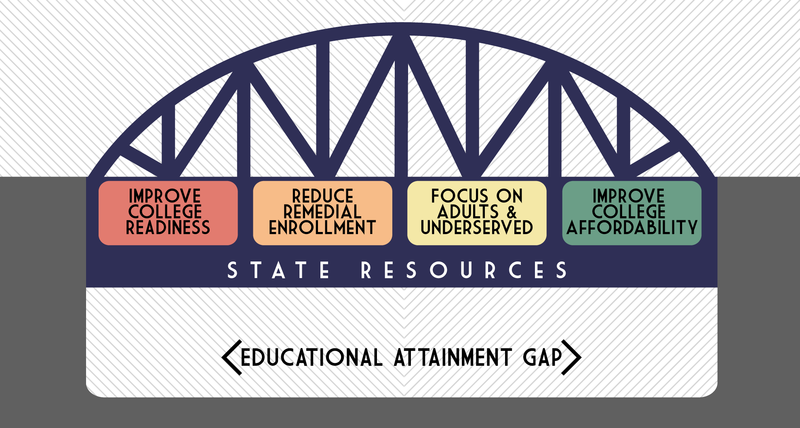 GOAL 3: Raise the attainment rates of underserved student groups in the state by 10%. Raise completion rates of underserved student groups equal to other students. As we develop the Closing the Gap Master Plan, we are seeking input from higher education stakeholders across the state. To join the conversation, choose a topic below to find out more about how you can be a part of this process.